Beets are rich in minerals and aid in liver detoxification. As we prepare for spring, they are an excellent ingredient to include in roasted vegetable dishes, soups, and in baked goods, too. They lend an earthy sweetness to any dish. These beautiful root vegetables come in red, pink, yellow and striated varieties. They are a unique source of phytonutrients called betalains. These plant nutrients provide antioxidant, anti-inflammatory, and detoxification support. They are an excellent source of manganese and vitamin C, which support nervous system health. Foods belonging to the chenopodium family — including beets, chard, spinach and quinoa — are also high in carotenoids, which support eyesight. Beets are high in betaine, an essential nutrient made from the B-complex vitamin, choline. Choline reduces inflammation in the cardiovascular system by preventing unwanted build-up of homocysteine, an inflammatory compound. Here is a beet-based recipe to inspire you. I love making these for both children and adults. The beets blend so well with the chocolate that a deep, rich taste comes through and it's nearly impossible to guess what the "secret ingredient" is. Coarsely chop beets and place them in a pot. Cover them with water and boil for 15 minutes, or until fork tender. Strain off water and place beets in a blender or food processor with almond/rice milk. Blend well. Add all other ingredients and blend well. Oil a glass baking dish or pie plate with coconut or sunflower oil. Pour batter into it and bake for 30 minutes. Cool for 20 minutes, slice, and enjoy! When eating treats, it's great to choose those that contain protein. Because it takes the body longer to digest protein, blood sugar remains stable when eating sweets with protein. The digestive process takes all carbohydrates and turns them into glucose, a kind of sugar that's and released into the blood stream for energy. Insulin, a hormone made by the pancreas, helps cells to absorb glucose once it's in the blood stream so that they can use it to generate energy. However, if there is too much circulating glucose in the system, the body gets overloaded. By consuming excessive carbohydrates and sugar without the protein to slow down the release of glucose into the blood steam, sugar levels and hence insulin levels can become chronically elevated. This elevation can lead to inflammation, high blood sugar and pre-diabetes (also known as insulin resistance). Combining sweets and protein helps our body make the best use of the energy we gain from treats and keeps blood sugar balanced. Protein sources include: nuts, seeds, beans, lentils, meat, eggs, and cheese. Oil a cookie sheet with coconut oil. In a large bowl, whisk together almond butter, coconut oil, applesauce, coconut sugar, flaxseed, and vanilla. Mix in flour, cinnamon and salt until just combined. Fold in chocolate chips. Drop dough by rounded tablespoonfuls onto cookie sheet. Flatten in a criss cross pattern with the tines of a fork. Bake for about 15 minutes. Let cool on pan for 5 minutes before enjoying. The nights are getting cooler here in Vermont, and I am thinking about the kinds of warming, blood-building foods that will strengthen our immune systems in preparation for the colder months. Molasses is an excellent source of iron, supports blood and heart health, and is packed with minerals. Try to find sorghum molasses, which is derived from a low-glycemic, gluten-free grain: sorghum. A relative of millet, sorghum is native to North Africa. It is a warming and tonic food that helps build fluids in the body and regulates digestion. When boiled, it creates a delicious and rich syrup that takes this recipe to another level. If you cannot find sorghum, unsulphured cane sugar molasses will do just fine. This recipe is rich in medicinal spices to balance blood sugar (cinnamon), support digestion and endocrine health (nutmeg, ginger and cinnamon), and ward off the cold and flu (ginger and cloves). Grease a baking dish with coconut oil. I use either an 8x8 dish or a loaf pan. Mix all ingredients together in the order listed. Spread evenly into baking dish and bake for 25 minutes. Check for done-ness by inserting a knife blade into the center of the bread. Bake for 5 more minutes if necessary. Cool 10 minutes before slicing. Enjoy! Summer is here! Berries are one of my favorite aspects of summer cooking and eating. They are so high in healing plant compounds, low on the glycemic index, and naturally sweet. I take every opportunity to savor them during their short season. This recipe features blueberries, which are high in phytonutrients that reduce inflammation and oxidative stress in the body. They lower triglycerides and protect cells and blood vessels in the heart. Blueberries improve memory, support the nervous system, and balance blood sugar. Try to eat 1 cup of blueberries daily to reap their health benefits. This cake is gluten-free, grain-free, and high in protein. Preheat oven to 350 degrees. Melt coconut oil in a 9x9 cake pan in the oven. Mix all the ingredients together in the order listed. Pour the melted coconut oil into the bowl and mix well. Pour batter into cake pan. Bake for 30 minutes, or until a toothpick comes out clean when inserted. This is truly the icing on the cake! Mix all ingredients together in a sauce pan and simmer on medium heat for 5 minutes. Cool slightly before pouring it over the cake. Set aside to cool for 15 minutes. It's even more delicious the next day after the glaze soaks into the cake. Are you trying to eat food without gluten? This practice can help heal gut imbalances such as dysbiosis, SIBO (small intestine bacterial overgrowth), IBS (irritable bowel syndrome), leaky gut syndrome, constipation, diarrhea, gas and bloating and a whole host of other conditions. Eliminating gluten also reduces inflammation, thereby improving mood, providing energy, and rerong, reducing the symptoms of auto-immune disorders. Avoiding gluten is also a great way to simplify your diet and head into the winter with strong immunity. However, one caveat: packaged gluten-free breads and baked goods are just as toxic to the system as those containing gluten. Please stay away from them. When you are craving bread or a baked good, try your hand at these simple recipes. Preheat your oven to 400. Chop sweet potato into chunks, place on a cookie sheet and toss with olive oil and salt. Roast sweet potato in large chunks for 30 minutes. Remove from oven. If you would like, roast a larger quantity of sweet potato and set some aside to have as a snack with nuts or nut butter. Place the sweet potato, coconut flour, yoghurt, and eggs into your processor and blend until the mixture resembles a smooth, runny batter. Add the soda and mix to combine. Chop pecans and fold them into the mixture if using. Reduce oven heat to 350. Pour the mixture into your prepared tin and bake for 45 minutes. Remove from the oven and cool in the tin for 10 minutes before gently transferring to a cooling rack. Allow to cool for 30 minutes prior to cutting. Put all ingredients in a blender or food processor and blend well. Grease a loaf pan with coconut oil. These also make great muffins! The recipe makes about 9. Scrape in the cornbread dough; it will be thick like cookie dough, not a pourable batter. Press down on the top to form an even layer. It is easiest to do this with a rubber spatula. Bake for about 30 minutes or until the top is golden brown. Looking for a healthy treat recipe that kids and adults alike will enjoy? 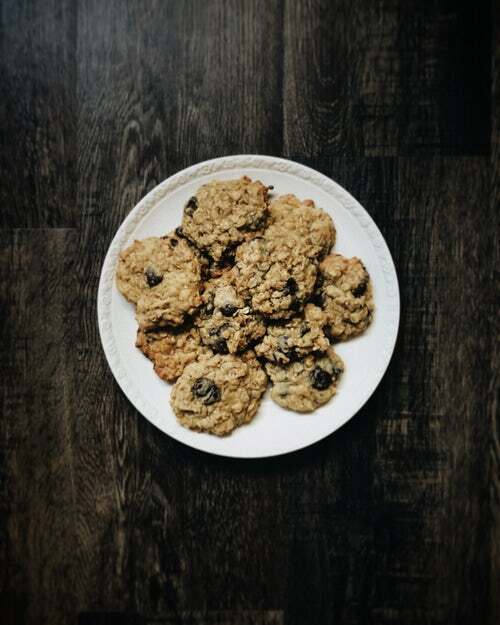 These cookies are amazing because they taste good and are high in protein, which curbs the blood sugar spike and subsequent crash that happen when we eat sweets without protein. In a medium-size mixing bowl mix together flours, spices, and chocolate chips. Make a well in the center of the flour mixture. Add the eggs, almond milk, maple syrup, almond milk, coconut oil and vanilla extract. Whisk these together, then incorporate with the other ingredients. Oil a cookie sheet with coconut oil. Place on cookie sheet in heaping spoonfuls. Bake for 15 minutes or until golden brown. Summer is transitioning into its late stages and we move from enjoying the bitter flavor of quinoa olives and salad greens to embracing the sweet flavor of millet and round vegetables. Why not mix the bitter and the sweet in this delicious chocolate cake recipe? Try it and let me know what you think. It makes a great birthday cake. Melt butter and chocolate in a double boiler over medium heat. Place in food processor with all other ingredients. Pour in greased cake pan and bake for 30 minutes or until a toothpick comes out clean. The first carrot fronds are popping out of our rich garden soil. The long summer days are hot and we give the beets and carrots some extra water to encourage their growth. As the first tiny carrots come into the summer harvest, I give thanks with this delicious, wholesome and protein-rich carrot cake. Try it for yourself! 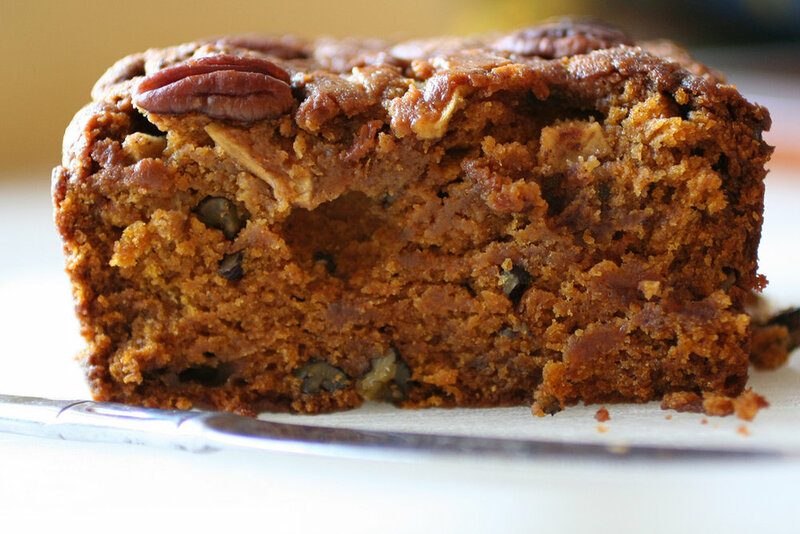 It happens to be vegan, gluten-free, grain-free, and sweetened only with dates. Preheat oven to 350 degrees. Oil a cake pan with olive or sunflower oil. Place all ingredients EXCEPT carrots in a food processor. Blend well. Fold in carrots. Smooth into cake pan and bake for 20 minutes. Meanwhile, make coconut frosting to go on top. Place all ingredients in a small pot. Heat gently, whisking and stirring to blend. Spread a light layer of frosting onto baked carrot cake. With gratitude to My Whole Food Romance for this inspiration. Spring is a time to lighten up, eat fewer refined foods, and move towards the whole, local ingredients that support the health of local farms, the bioregion, and your body. May this practice of eating simple, seasonal, flavorful food help you connect with nature and welcome each day as an opportunity for rejuvenation and new discovery. May day is honored in Northern traditional cultures as Beltaine, a celebration of passion, creativity, fertility and the resplendent sun, which shines warmer each day and lingers longer each evening. Spark your passion and creative impulse by getting in the kitchen and making these wholesome treats! They also happen to be vegan and gluten-free. Chop and boil the sweet potatoes. Keep the skin on for maximum nutritional benefit. Drain them and allow them to cool. Lightly oil an 8-inch square-baking pan with olive oil. Place all topping ingredients in a food processor bowl and pulse until mixture reaches a coarse meal that's evenly moist. Transfer the mixture to the prepared pan and press it evenly and firmly into the bottom. Bake the crust for 15 minutes or until set. Remove from oven. Place all the topping ingredients in the food processor and blend until smooth. There's no need to wash the processor between the crust and the topping. Pour the mixture onto the crust and smooth the top evenly with a spatula. Bake about 25 minutes. Allow to cool, then chill in the refrigerator for 2 hours. Enjoy! Sweet potatoes: high in omega 3 essential fatty acids to tonify the internal organs and strengthen immunity; rich in carotenoids and omega-3s, whose anti-oxidant content offers anti-inflammatory support; high in vitamin C to boost immunity; rich in B vitamins to reduce stress. *You can substitute cashew or peanut butter. Preheat the oven to 350 degrees. Lightly oil a baking sheet with olive oil. Place all ingredients in a bowl and mix well. Using a soup spoon, evenly space scoops of the mixture on the baking sheet. Press down with a spatula or back of the spoon to slightly flatten. Cool on the baking sheet for 10 minutes before transferring and eating! Almonds: high in monounsaturated fat, which promotes heart health, helps reduce LDL cholesterol, and aids in carbohydrate metabolism, thus contributing to weight loss; high in flavoproteins to balance blood sugar and improve energy levels; rich in vitamin E to promote cognitive abilities and protect the brain. Thanks to Rebecca Katz for this inspiration! My birthday is December 20th, which is very close to Winter Solstice. I honor this time of rest, darkness, short days and long nights. It feels like a privilege to be born at this time of year when so many cultures celebrate the little spark of light inside that keeps the soul alive and thriving throughout difficult times. One thing that nourishes me during this time is preparing simple sweets that are both delicious and wholesome. This year, I made my own birthday cake, which was a delight. I adapted this traditional North African recipe to include some Vermont ingredients. Try to make it at home! It would make a lovely addition to a holiday brunch or a New Year's party. Preheat oven to 375 degrees. Oil a cake pan with olive oil. Place all cake ingredients in a blender or food processor in the order listed. Omit the zest and shredded coconut. Blend well. Add in the zest and shredded coconut. Mix gently by hand. Pour into cake pan and bake for 30 to 40 minutes, or until a knife tests clean when inserted. Place all ingredients in a small pot and heat to a simmer. Reduce heat to low and cook, stirring occasionally, until reduced to half the volume. This will take about five minutes. Set aside and spread over cake once it comes out of the oven. Cool the cake for 10 minutes before slicing. Divine! Dry weather and oily, rich winter foods can cause constipation, gas and bloating. If your digestion suffers in the winter because the air is so dry and the meals are heavier, pears are a perfect antidote. 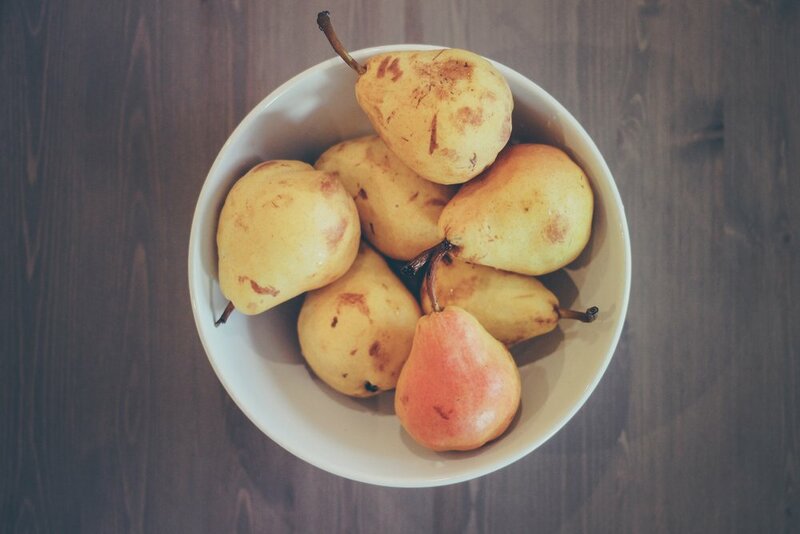 Pears are loaded with flavonols, plant nutrients that provide anti-inflammatory and anti-oxidant support. They are high in pectin, a sugar loaded with galacturonic acid, which coats and soothes the intestines to reduce symptoms of heartburn, ulcers, GERD, acid reflux, and colitis. Pear fibers bind with bile acid in the intestines, making them soothing and easily digestible. They are an important part of a low-allergy diet and. In my native Italy, they are one of the first foods given to infants. These recipes also feature cardamom and olive oil, both of which support digestion in crucial ways. Cardamom is a fragrant and floral spice native to Southeast Asia that reduces gas and bloating. Its warming and soothing quality makes it a perfect pairing to pears. Olive oil is a polyunsaturated fat that hails from various parts of the world, including Greece, Syria, and Italy. First cold press olive oil is high in anti-inflammatory polyphenols, which reduce risk of heart disease, maintain a balanced cholesterol profile, and reduce the overgrowth of ulcer-inducing helicobacter pylori bacteria in the intestines. These delicious muffins are more like dessert. They are gluten-free, (almost) dairy-free, and free of refined cane/beet sugar (adapted from the Five and Spice blog). Heat your oven to 375 degrees and grease a muffin pan with olive oil. In a medium bowl, stir together the almond flour, oats, spices, and salt. Make a well in the center of the dry mix and add the maple, oil, coconut milk, vanilla, and egg. Whisk these together and then fold dry ingredients into wet until mostly smooth and fully combined. Add the chopped chocolate and pear at the end. Spoon the batter into muffin tins, filling each cup almost to the top. Bake until brown and a toothpick inserted into a muffin comes out clean, 15-18 minutes. Allow to cool for 10 minutes in the pan before removing and serving. These muffins are best eaten the day they are made. This light, fluffy tart is a wonderful brunch addition or a simple treat to serve at the end of a holiday meal. Preheat oven to 350 degrees. Oil a 9 inch pie plate or cast iron skillet with olive oil. Slice pears in half, core them, and then slice each half into about 3 smaller slices. Place these slices them in a bowl of lemon juice and water to keep them from browning. Set aside. In a large bowl, stir together flours and spices. Make a well in the center and add the rest of the ingredients, minus the pears. Whisk these together, then incorporate them with the dry ingredients. Pour batter into greased pan. Pat pears dry and arrange them in a circle over the batter. Bake for 25 minutes and cool for 10 minutes before serving. Would you like to learn more about which foods are ideal for you? Try a free initial consultation with Lisa. Last night, I attended a pot luck and, as usual, decided to create an experimental dessert without following a recipe. I love the mystery and delight that arise through this creative process. I knew that some of the potluck attendees are gluten-free and dairy-free. Others prefer not to eat any refined beet / cane sugar. I wanted to keep the ingredients list simple, so I created this recipe. The more you cook without recipes, the more you will understand which ingredients combine best. Keep experimenting! 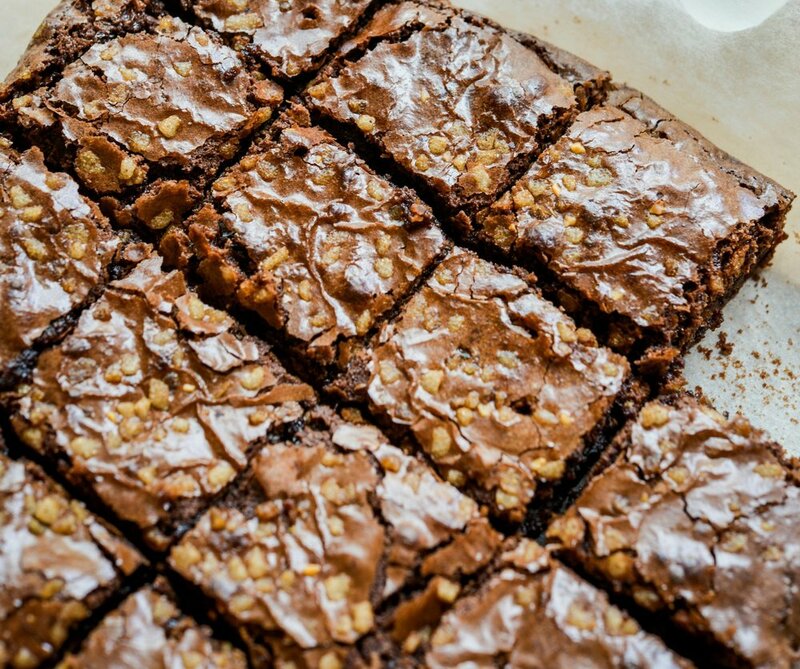 Try these brownies and let me know what you think. The beauty is that they only contain 5 ingredients, most of which you may already have in your pantry. Blend all ingredients with an immersion or upright blender. Pour batter into it and bake for 35 minutes. When I have too much zucchini, I shred it, put it in freezer bags, and freeze it for winter soups and breads. Zucchini is a member of the cucurbitaceae family (along with pumpkins, melons, and summer squash). It provides a very good amount of dietary fiber (2.5 grams per cup); rich in pectin fibers to help regulate blood sugar; reduces inflammation in the cardio-vascular system and gastro-intestinal tract; rich in B vitamins. Grease a cookie sheet with olive or sunflower oil. Combine all ingredients in a mixing bowl and whisk well. With a soup spoon, scoop out cakes and place them cookie sheet. Oil a loaf pan with sunflower oil. Blend all ingredients in the order listed. Bake at 350 degrees for 45 minutes. This is great for breakfast topped with poached eggs or almond butter. Bake at 375 degrees for 40 minutes. Oil a cake pan with sunflower oil. These make great cupcakes, too! Just place the batter in muffin tins instead of a cake pan. Bake cupcakes for 20 minutes instead. June is here. Firefly season in Vermont. Lupines blooming blue next to ox-eye daisies. The angelica, black cohosh and feverfew plants tower over the garden, delighted to be its protectors. Last fall's potatoes are sprouting: it's time to plant them. The soil is warm enough for winter squash seeds to sprout and peas are almost a foot tall. At our homestead on Sparrow Farm Road, this is the time we await with delight. Whatever summer looks like for you, soak in it. Sit with the evening and let yourself become absorbed in the pink light as it slowly gives way stars. Find local raspberries ans strawberries to make an amazing topping for this vegan cheesecake. Chop nuts and dates into small pieces. Sprinkle with salt and cinnamon. Mix well. 'Flour' bottom of 9 inch spring form pan with shredded coconut. Press crust evenly on bottom. Place all ingredients in a food processor and blend into a smooth cream. Add water as needed to make a smooth, thick batter - like pancake batter. Smooth into pan and place into freezer until firm - about 12 hours. Before serving, defrost on a plate 1/2 hour. Top with fresh, chopped raspberries and strawberries. The corporate food industry has taken wheat, which is highly nutritious and rich in protein, B vitamins, and complex carbohydrates, and de-natured it into a high yield grain. It is largely indigestible, not only because it comes from grain that has been genetically engineered, but also because the resultant flour is stripped of its bran and germ. The bran and germ are home to vitamins, minerals, protein, and fiber. Our bodies need these compounds to metabolize the grain effectively. Due to an over-consumption of this hybridized wheat, which the body doesn't actually recognize as food, many of us have become gluten-sensitive. Here are some tips to create your own gluten-free flour blends without the strange additives. Just use this rule of thumb: 70% whole grain or nut flour blend to 30% starches – no xantham gum needed! Some whole grain flours are more dry and light. Others are more moist and dense. Make sure that you use a balance of these two in your 70% mixture. Think about the outcome: if you want a rich, dense baked good, use more of the heavy flours. For a light, fluffy crust, use the lighter, drier flours. Consider that some flours taste better in savory or sweet batters, too. For example, a cauliflower pizza crust will do well with cornmeal. A brownie batter will thrive on brown rice or oat flour. Grease a cookie sheet with olive oil and drop dough in spoonfuls. Flatten each cookie with the back of the spoon. Slide cookie sheet into oven and bake for 20 minutes. Get creative! For variety, add one of the following: 2 spoonfuls raspberry jam; 1 inch fresh chopped ginger root & ½ teaspoon clove powder; ¼ cup raisins (first soak for 5 minutes in hot water and drain). Spring is here. In many gardens, rhubarb patches are flourishing. This amazing food is perfect for this season. It features the sour flavor, which, according to Chinese Medicine and Ayurveda, renews our digestive systems after eating the heavier foods of winter. Indigenous to Siberia, its leaves are so high in oxalic acid that they are somewhat toxic. Only eat the fresh stems before they become woody and stringy. Rhubarb is high in fiber and thus soothes stomach ailments and relieves constipation when eaten. Used topically, it makes an effective poultice to reduce swelling. One serving provides about half of the daily value in vitamin K, which supports healthy bones and strong memory. Rhubarb contains vitamin C for healthy skin and resistance to infection. It is also high in iron, potassium, and calcium. Mix together all the tart ingredients in a large bowl. Add the coconut oil last and toss it with the flour mixture so that each chunk is coated with flour. Mix gently with your hands until a thick dough forms. Flatten dough into baking dish and set aside. Then, using the same bowl, mix all the custard ingredients together. Whisk well to incorporate. Add the rhubarb and pour mixture into crust. Bake for 40 minutes or until custard doesn’t jiggle when you give it a shake. Cool, slice and enjoy topped with fresh strawberries if you like! In a large saucepan, combine the milk, tapioca, vanilla, and rhubarb. Cook for 30 minutes on medium heat or until the tapioca looks translucent. Add raspberries, lemon juice and honey. Stir well and cook on low heat for 3 to 4 more minutes. Serve in wine glasses or decorative bowls. Top with slivered almonds if you like. Combine all ingredients in a saucepan. Bring to a boil over medium-high heat. Reduce heat and simmer until the rhubarb forms a thick paste, about 10 minutes. Remove from heat and set aside. Store in jars in the fridge for up to 3 weeks. Preheat oven to 350 degrees. Grease a muffin tin with oil or line with baking cups. In a large mixing bowl, cream together coconut oil and maple syrup. Add the egg and whisk well. Mix in the vanilla extract. Gradually add the rest of the ingredients in the order listed. Fill muffin cups two thirds full of batter. Using a spoon, make a slight depression in the center of the batter. Place a tablespoon of the rhubarb jam into the center (the jam will fill the cupcakes as they bake). Bake for 20 minutes, or until a toothpick inserted into the muffin comes out clean. This is my version of a cake I had at Eat Here in Florida. It was so good that I had to re-create it. Try it for yourself. Email me if you are disappointed for any reason. 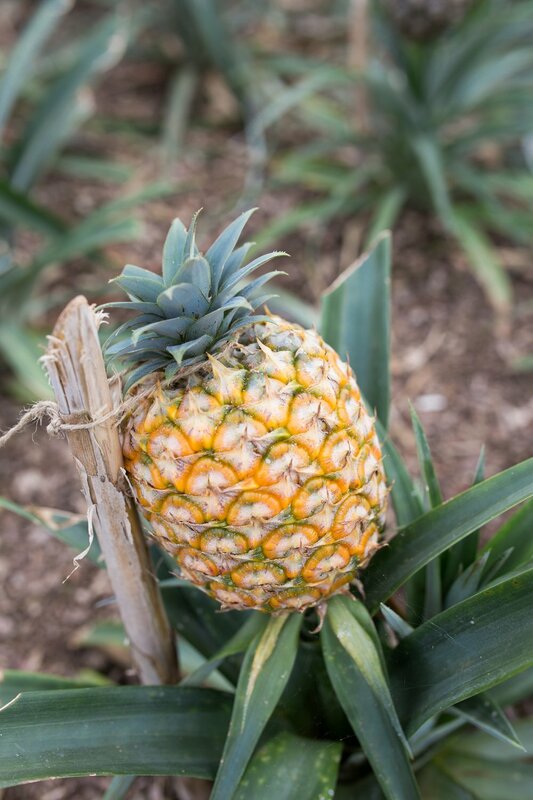 By the way, pineapple is packed with digestive enzymes and naturally very sweet. Oil a cake pan with vegetable oil. Place 1/2 cup of the pineapple chunks in it. Set it aside. Mince 2 inches of ginger root. Place some in a pan to make sauce and set some aside for the cake. In a bowl, mix flour, powder, salt, and spices. Add the rest of the pineapple and mix just until it is well coated with the flour mixture. Make a well in the center and add the rest of the ingredients. Whisk them with each other and then incorporate wet and dry together until just barely mixed. The batter will be gooey. Pour it over the pineapple and bake at 350 for 25 minutes. Let cool for 15 to 20 minutes. Turn out onto a plate. Garnish each slice with apple slices, a sprinkle of nutmeg, whipped cream and ginger sauce. Place all ingredients in a stock pot. Bring to a boil, reduce to simmer, and cook, whisking occasionally, for 10 minutes or until it is a thick paste. Smoothies are not just for breakfast! Enjoy them as snacks when the afternoon blues hit or serve them in a little cup as dessert when visitors come to dinner. With the coming new moon and spring equinox on March 20th, these recipes will uplift you and inspire you to sow seeds of intention for the season to come. 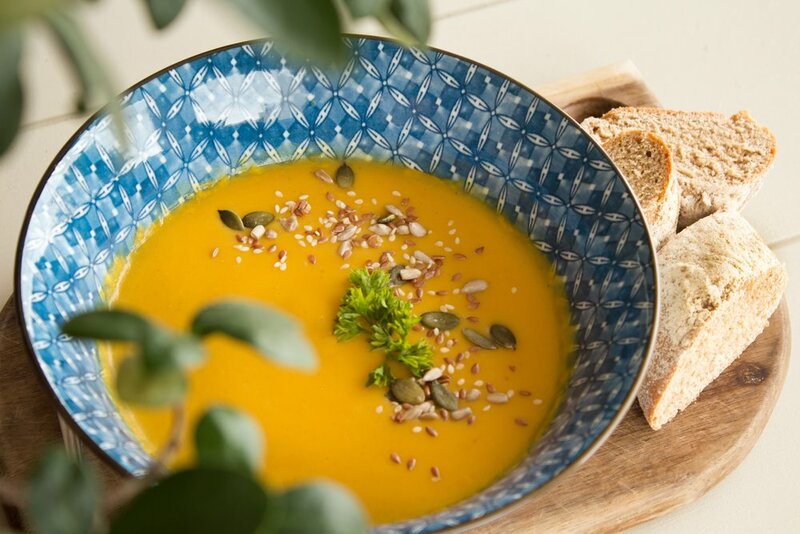 Each one of these recipes features coconut, which helps to tone and nourish your hormonal and digestive systems and bring the balance that's synonymous with this time of year. Saturated fat, solid at room temperature, coconut is a plant-based alternative to saturated animal fats. It stimulates brain function and promotes intestinal motility. Its anti-bacterial action makes it an important fat to choose during times of illness or infection and is specifically indicated for combating intestinal parasites. This food is considered sacred by people from the Indonesian Archipelago to the Indian Sub-Continent because of its potent healing properties. Deer are browsing the crab apple branches and chickadees buzz between bee balm stalks to stay warm. I love this time of year. It is peaceful. The snow that blankets everything is a metaphor for stillness. Take ease in this time. There is nowhere to go, nothing to do. Even if the holiday commitments are piling up, take time to rest each day. Even if you rest for five minutes while sitting at a window or on your couch with a cup of tea, this practice invokes the stillness of the upcoming Winter Solstice, the longest night of the year. This is the stillness that rejuvenates, respects the spirit, eases the mind, and clears stress from the body. From this calm place, ask yourself what you need to be truly nourished. I like to prepare soups, whole grains, and delightful, wholesome desserts at this time of year. My husband and I sit, light a candle, and savor carrot ginger soup. I wake up to a simple, hearty breakfast of eggs poached in greens. I enjoy baking simple desserts and sharing them at holiday gatherings. This way, I avoid eating lots of white flour and white sugar and having a headache and bellyache the next morning. 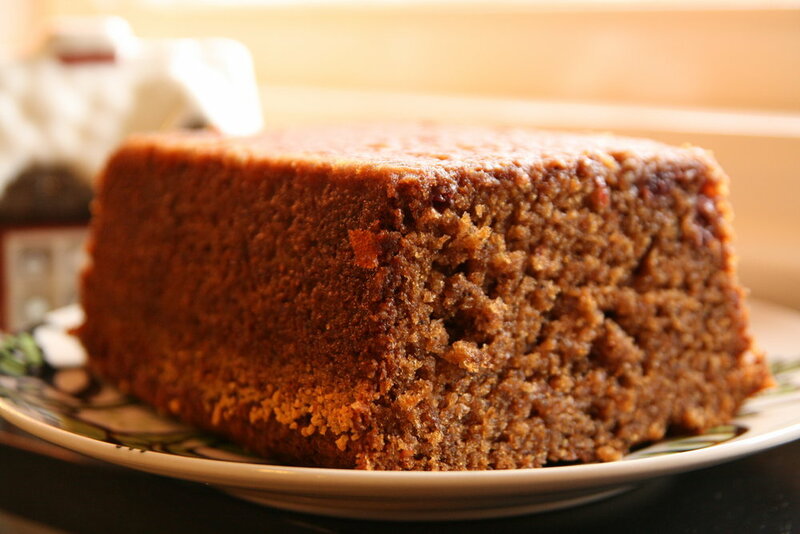 Try this maple gingerbread (gluten-free) to inspire your holiday baking.